Hand-Rearing Birds will provide the reader with a guide to the best methods of hand rearing all major species of birds. The book is broken into two sections. The first section covers standard hand raising methods and equipment, while the second provides individual chapters devoted to many major avian species. This book will be an invaluable reference for shelter veterinarians, zoo veterinarians, avian veterinarians, aviculturists, bird enthusiasts, and conservationists alike. This book was several years in the making, and is the result of hours of conversations among many colleagues at zoos, wildlife rehabilitation centers, universities and veterinary facilities, as well as with private bird enthusiasts. But ultimately, the idea was hatched with Dr. Gage being heard to utter shortly after she ﬁnished writing Hand-Rearing Wild and Domestic Mammals, “Hey Becky, we should do a book about raising birds!” Perhaps Dr. Duerr’s hearing was a little too good on that day. None the-less, with the help of our talented friends and colleagues we were able to create another resource, this time to help feathered creatures ﬁnd their way in this world. With over 9,600 species of birds currently recognized, we realized that covering the topic of hand-rearing birds could easily ﬁ ll a set of encyclopedias. Even if we limited the scope to North American species, it still would not allow for great detail on even those most commonly raised. 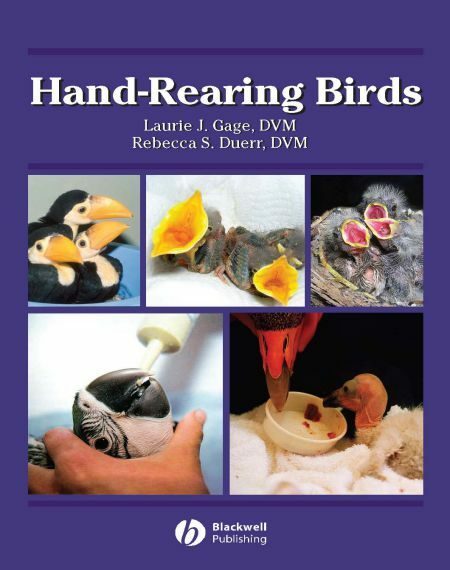 Although there are several books that discuss hand-rearing speciﬁc species, and Dr. Fowler’s Zoo and Wild Animal Medicine covers medical care of various taxa of birds, there is no single text that gives basic information about hand-rearing the more common species of birds. We ﬁnally settled on the following organization: general care of unidentiﬁed baby birds in Chapter 1, an identiﬁcation guide to common North American orphans in Chapter 2, a chapter on general incubation of eggs in Chapter 3, and then 35 chapters dedicated to highlighting species from most of the currently recognized avian orders.